Non-Small Cell Lung Carcinomas (NSCLC) account for around 85% of lung cancers and includes predominantly adenocarcinoma and squamous cell carcinoma. Depending on the patients’ medical status and stage of disease, treatment options include surgery, radiation therapy and chemotherapy. Although cytotoxic chemotherapy remains an important part of treatment, targeted therapies based on genetic alterations in the tumour are appropriate for selected cases. Identifying disease-causing variants in oncogenes associated with NSCLC can help determine which patients are more likely to benefit from a targeted therapy. Rearrangements of the gene encoding anaplastic lymphoma kinase (ALK) have been linked to abnormal proliferation and NSCLC (most commonly adenocarcinoma). The most common ALK rearrangement in NSCLC is EML4-ALK, which arises from fusion between the 5’ end of the EML4 gene and the 3’ end of the ALK gene on chromosome 2p23. Patients with ALK rearrangements are younger than most patients with NSCLC. 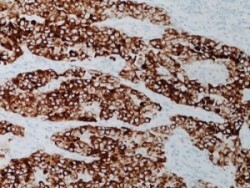 EML4-ALK rearrangements are also more common in adenocarcinomas of light or non-smokers. In addition, ALK gene rearrangements are rarely coincident with EGFR, HER2 or KRAS variants, indicating it is a distinct disease subtype. Patients with ALK rearrangements may be considered for therapy targeting the activated receptor tyrosine kinase (TKI) that results from EML4-ALK and other ALK fusions. Responses to anti-PD-1 and anti-PD-L1 agents are enhanced in patients whose tumors express high levels of PD-L1 compared with those expressing low or no tumor PD-L1. As such, reliable testing assays are required to inform treatment choices. Broad access to high-quality PD-L1 testing will help clinicians to identify the most appropriate treatment option for individual patients with NSCLC, including chemotherapy versus anti-PD-1/PD-L1, and single-agent anti-PD-1/PD-L1 versus combination immunotherapy regimens. Current data indicate that PD-L1 expression predicts survival outcome in lung cancer patients treated with PD-1 antibodies.